A construction worker builds a commercial complex in Springfield, Illinois. U.S. employers listed 4.7 million available jobs at the end of June, 700,000 more than a year earlier and the most since 2001, according to new data released Tuesday. Meanwhile, the number of unemployed workers has been falling steadily and is now below 10 million. As a result, the remaining job seekers face their best prospects of the recovery: There are now two unemployed workers for every job opening, down from about seven at the height of the unemployment crisis. But wait. That chart only includes people who are officially unemployed, and as regular readers know, the government’s definition of unemployment includes only people who are actively looking for work. What about the millions of Americans who have given up? The government tries to count them in a separate measure that includes people who aren’t actively searching for work but who want a job, are available to work and have looked for work within the past year. 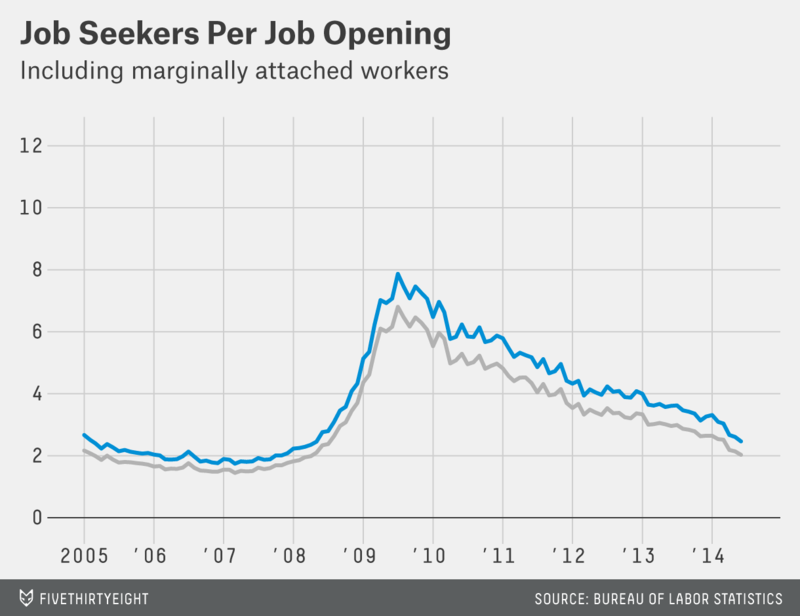 There were about 2 million so-called marginally attached workers in June. Add them to the officially unemployed, and the ratio of available workers per job opening rises — but the trend of improvement stays the same. But even that definition of “available workers” might be too narrow. Some people have likely become so discouraged that they haven’t looked for work in the past year. Others might have taken on family responsibilities or gone back to school, meaning they aren’t available for work right away. To capture such people, we can look at an even broader group: everyone who reports that they want a job, regardless of when they last looked or whether they’re immediately available. Once again, the ratio rises but the overall trend looks the same. Even that measure, however, doesn’t count everyone who wants a job. More than 7 million Americans are working part-time because they can’t find full-time jobs. Those people might not be jobless, but they’re still looking for more work. Include them and there are five available workers for every job opening. But the ratio is still falling at about the same pace. In other words, the improving job market isn’t just the result of the government’s definitions. 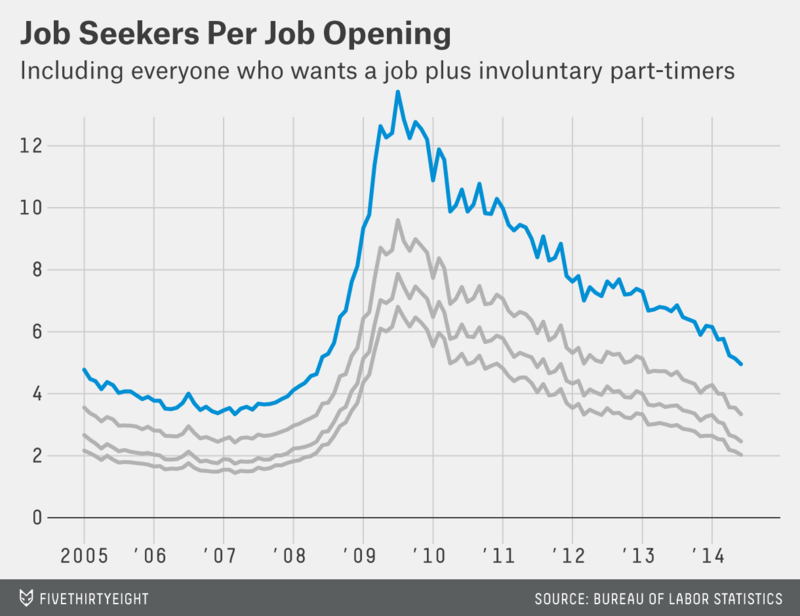 There really are fewer people vying for more job openings. That fits with other evidence. Job growth has topped 200,000 for six consecutive months, and Tuesday’s report showed that the number of hires continues to rise steadily, though at a slower pace than openings. The number of people quitting their jobs, a measure of confidence in the labor market, hit a post-recession high in June. 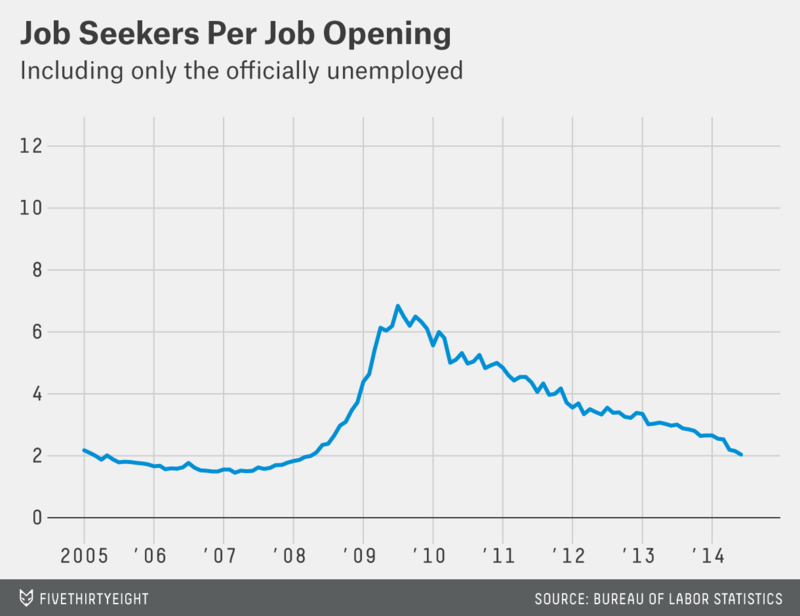 That doesn’t mean the job market has fully healed. 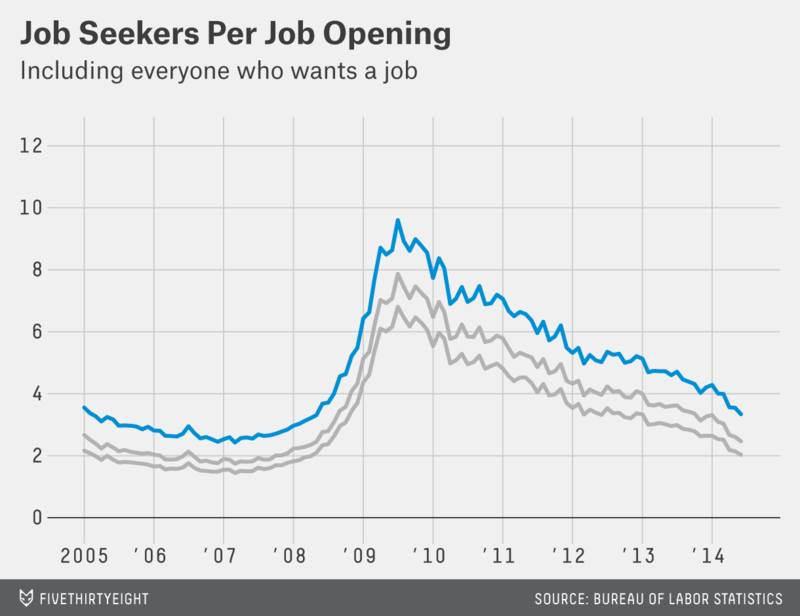 Despite the recent gains, there are still more workers per job opening than before the recession began. The hiring statistics also don’t reveal anything about the quality of jobs being created; muted wage growth suggests that many people still aren’t seeing much of a recovery in terms of take-home pay. The long-term unemployed, meanwhile, have made minor progress, at best. Things are getting better, but they aren’t good yet.